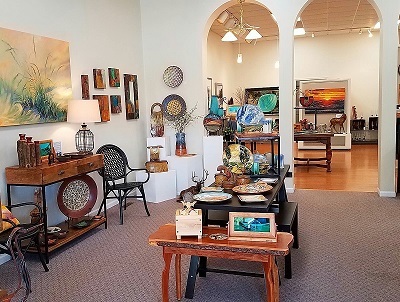 Nestled just one block from Lake Michigan in the quaint harbor village of Pentwater, Petri Gallery is a feast for the art lover's eyes. Now with two locations, Petri Gallery is right across the "Village Green" park on Second Street, and also on Hancock Street across from the Village Green. The galleries are the perfect place to stroll down to with an ice cream cone and enjoy the talent of a wonderful local artist, Cheri Petri, known world-wide. Her galleries feature her own artwork, and the artwork of her late husband, Bert Petri. One will find paintings done in watercolor, acrylic, oil, as well as pastel. Limited edition prints and Giclee prints are also available at both Petri Gallery locations. Cheri Petri is a well-known artist with collections of paintings all over the world. 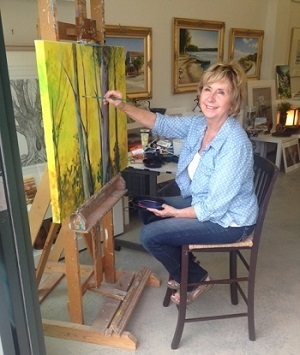 A resident of Pentwater in West Michigan, Cheri has a strong passion for art, especially for painting. 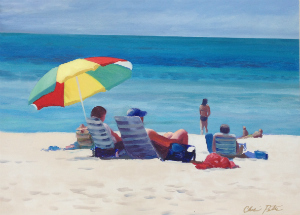 Cheri is mostly known for her paintings of children playing on the beach, although recently she has been doing more experimental work, as well as abstract painting. Cheri currently teaches classes at her gallery on 2nd Street. In 2012, Cheri submitted a beautiful piece in ArtPrize that included layers of painted plexiglass 7 by 7 ft with LED lighting. This ArtPrize piece is now permanently displayed at the Ludington Area Center for the Arts in downtown Ludington. Before opening Petri Gallery May of 2014, she used to sell her paintings at "Our Gallery" for 25 years with her late husband, Bert Petri. Bert was also well-known as an artist focusing on nautical paintings, and he published a book in 2008 titled "The Complete Guide to Painting Water." Many of Bert's paintings and prints are for sale at Petri Gallery. Along with the famous paintings of Cheri and Bert Petri, there are many other great gifts and art for sale at both galleries including pottery, greeting cards, scarves and shawls, glass art, wood bowls, hand crafted jewelry, sculptures, baskets, lamps and furniture and so much more! We are constantly bringing in new art, so stop in often! Cheri teaches painting classes every Tuesday in the morning and afternoon. Her classes are great for any level of artist, whether beginner or professional. Bring your own supplies to the Tuesday painting class, or there are limited supplies available for purchase at the gallery. 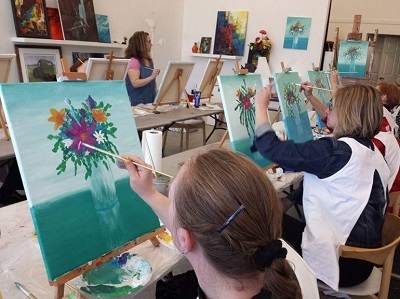 On Wednesday evenings, Cheri teaches Cork and Creations, a step-by-step painting class where you can unwind with a glass of wine, some friends, and go home with a complete painting at the end of the night! Cork and Creations classes are from 6-8pm, $35 and includes all supplies and wine. For anyone interested in taking Cheri's classes, sign up is at the Hancock Street Petri Gallery in Pentwater. Other classes available this summer with limited dates are Children's Classes, Watercolor Workshops, Pastel Workshops, and more. Please stop by or call the gallery for a schedule of classes. Stop by Petri Gallery Today! The 2nd Street gallery offers beautiful art and gifts, and is also where our classes take place. The gallery on Hancock Street offers art, gifts, and professional framing. Each gallery has different artists, so be sure to stop in and look around at both of the locations! There is something for everyone and every budget too! Every last Saturday of the month from May-September, be sure to stop by our galleries from 5-8pm for the Gallery Stroll. We will have a featured artist of the night, as well as snacks and refreshments! If you visit all seven of the participating galleries that night and get a card stamped at each location, you will be entered to win a $25 gift certificate! Petri Gallery on Hancock Street is open Monday-Saturday 10am-5pm, and Sunday 12-4pm. The Second Street location is open by appointment and during classes.